We are excited to announce our newest project, the Goldstream Valley Greenbelt! Many local community members and other Fairbanks residents enjoy the excellent recreation opportunities offered by Goldstream Valley. 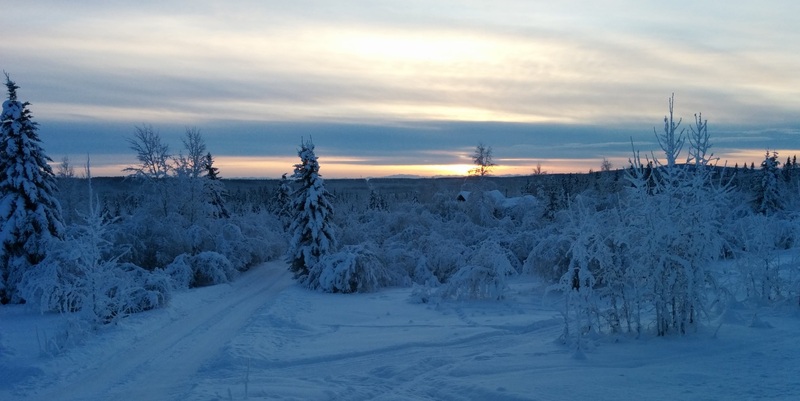 The area is crisscrossed with multi-use trails enjoyed by berry pickers, hikers, bird watchers, and dog walkers in the summer, and by dog mushers, skiers, snowmachiners, and many others in the winter. Goldstream Creek runs through the Valley, creating tussocky wetlands that provide habitat for moose, fox, hares, countless birds, and many small mammals, not to mention the native plants that thrive in these marshy areas. These open spaces and trails play a large role in making Goldstream an excellent place to live, and nearly 2,000 acres in the Valley are already protected as the Goldstream Public Use Area. The Public Use Area enjoys tremendous local support, as was demonstrated in 2010 when the law that had designated it was set to expire. A variety of groups and residents stepped forward requesting that the GPUA continue in its current form, and the measure was passed unanimously in the state Senate. (Read more here). 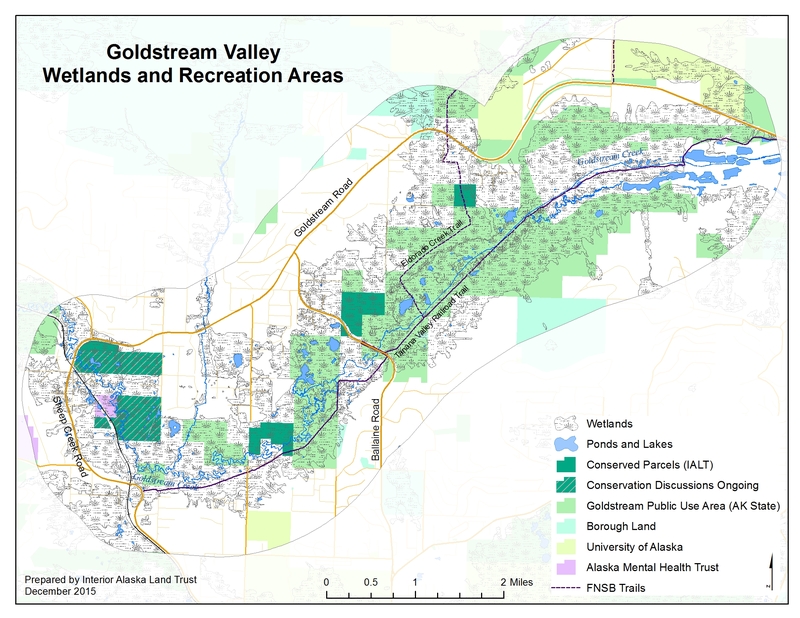 However, Fairbanks is growing quickly, and some Goldstream residents have come to us to discuss ways to protect more of the Valley. The well used Blueberry Preserves and Peat Ponds properties, which the Land Trust already manages, are in Goldstream Valley. In fact, the Blueberry Preserves are directly adjacent to the Goldstream Public Use Area. After the widespread support for our Chena Flats Greenbelt project, working to create a similar Greenbelt in Goldstream Valley seemed like a natural next step. The proposed Goldstream Valley Greenbelt aims to expand the current Goldstream Public Use Area, and to connect portions of the GPUA that are not currently connected. We are working collaboratively with willing and interested landowners to identify and conserve key parcels in the Goldstream Valley. If you are a landowner in the Valley, check out the “Conservation Options” tab at the top of the page (or give us a call! (907) 451-0737) to learn about options for conserving your land. In addition to the options listed, there may be the option to sell your land to an affiliated conservation organization. We work closely with landowners to come up with plans that are just right for your vision for your land so you will have a voice in every step of the conservation process. As Fairbanks grows, we believe it is important to preserve the open spaces that make Fairbanks unique. These open spaces increase the property values of adjacent land, enhance recreational opportunities, protect wildlife habitat, and provide long-term benefit to the community. Please help us make the Goldstream Valley Greenbelt a reality!